Board of Intermediate & Secondary Education Peshawar is the largest academic board of KPK province. 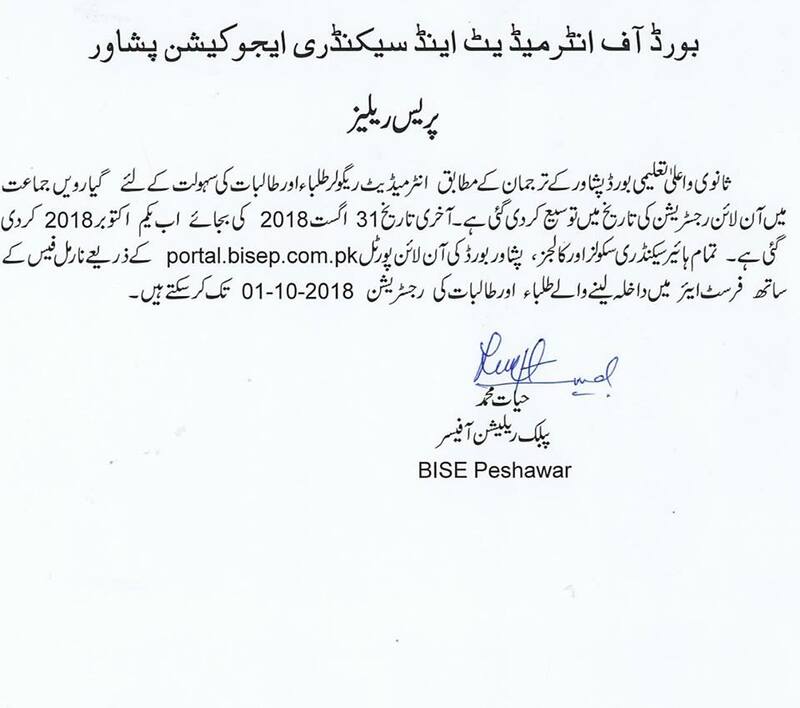 BISE Peshawar has the responsibility of conduct matric and inter annual and supply exams in Peshawar District, Chitral District, Charsadda District, FR Peshawar, Shabqadar, Khyber Agency and Mohmand Agency. Every year, thousands of regular and private students appear in the exams under Peshawar Board. BISE Peshawar organizes the 9th and 10th class annual exams during the months of March and April while 11th and 12th class annual exams are held in May and June every year. The admission process starts and ends according to the examination schedule. Few months before the start of the exams, the examination admission process starts after which the admission forms are available for the interested students and the schedule of examination form submission is announced by the board. Students deposit fee and submit completely filled forms along with the necessary documents. If the students could not submit the forms in time then they can also submit the forms with late fee and double fee also. The forms are usually accepted till one month before the start of the exams. Few days before the start of the exams, the roll number slips are sent to the students by Peshawar Board which gives details about the exams for the students. The admission forms should be filled with caution as mistake or deficiency will make it very difficult for the students to sit in the exams and they have to resubmit the form very quickly after completing and correcting it within given time. Peshawar Board receives registration forms from 5th & 8th grade students and students submit Peshawar Board fifth & eighth classes admission forms 2019. The government schools receive admission forms from their students for further submission to Peshawar Board for coming BISE Peshawar primary and middle classes annual exams 2019 and also pay the admission fee within given time frame.